Investment performance data provided by FoundationMark. As the chart above and table below show, 4 of the the top 5 performing states in for the year ended December 2017 were in New England – Rhode Island, Maine, Vermont, and Connecticut, with Pennsylvania rounding out the top 5. 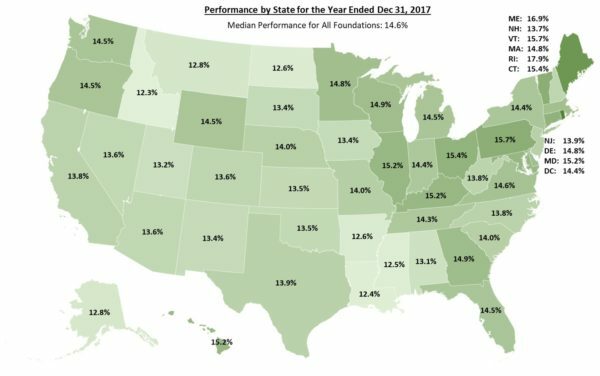 Foundations in Idaho, Louisiana, and Mississippi had the lowest median investment performance among the states. It bears mentioning that 2017 was a very good year for global equity markets, unlike 2018. Therefore it will be interesting to see if these regional differences reversed once the 2018 returns are tallied (usually mid year). The table shows the relative performance versus the national medial, so the columns show the out-performance (in green) and under-performance (in red).